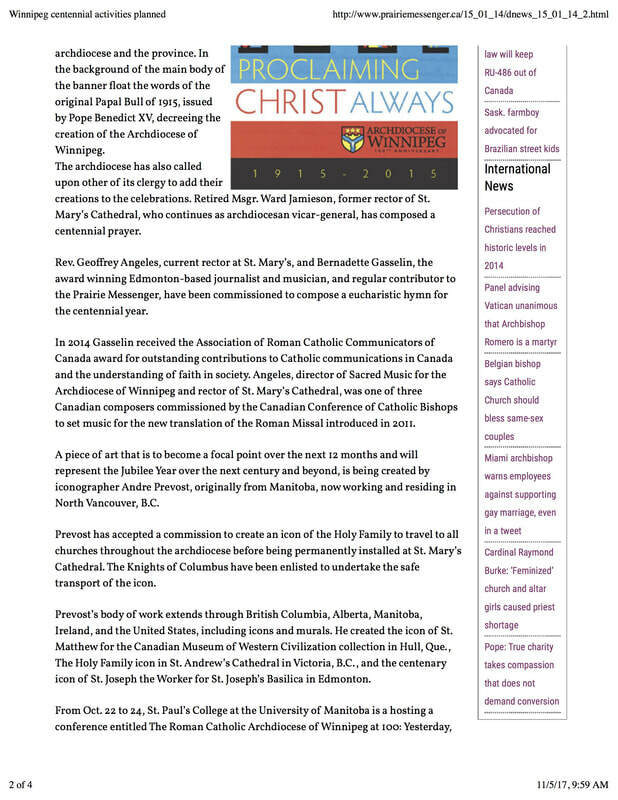 The central section of the Winnipeg Centenary Icon was featured on the front cover of the August 2014 'Living with Christ' edition. 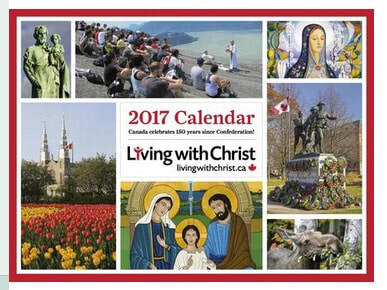 It also seems to be part of the 2017 Calendar. 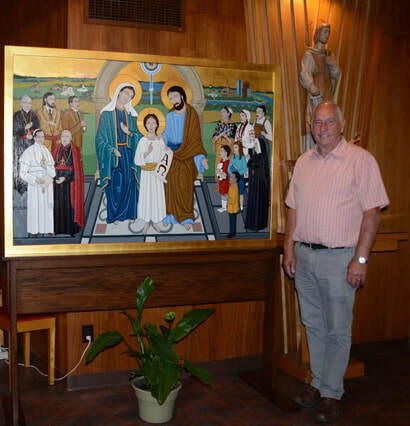 St. Joseph the Worker Parish in Russell Manitoba dedicated a summer weekend to celebrate the Archdiocesan Jubilee and to host the Jubilee Icon. The centre of the weekend celebration was an outdoor parish picnic that saw parishioners of all ages come out and enjoy joyful fellowship together. 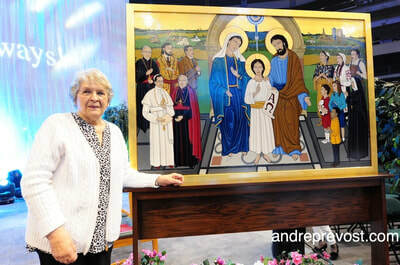 The Icon was very much appreciated by parishioners and served as a focal point for their weekend celebrations. 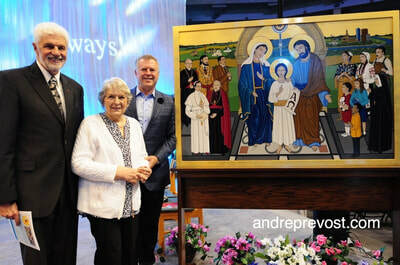 The parish centennial event concluded with Mass on Saturday evening." Centennial Icon with Deacon Conrad Plante standing by. 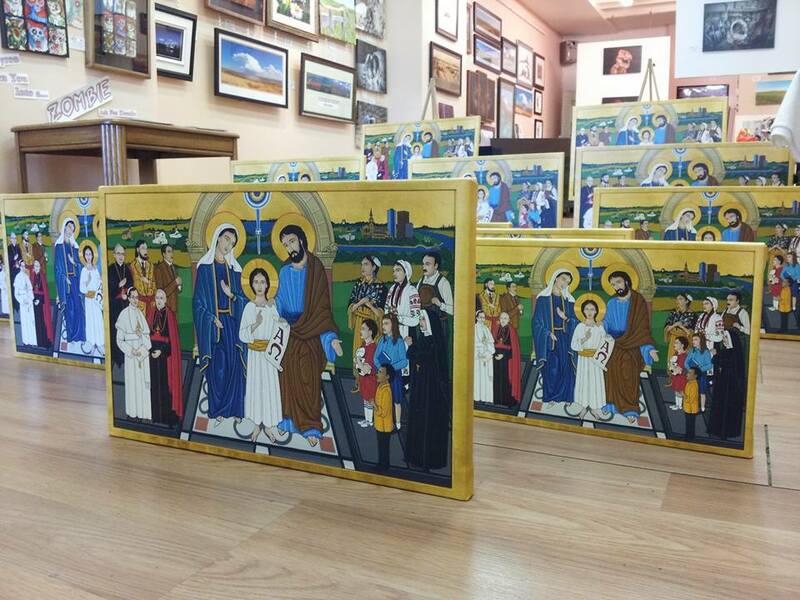 It was a surprise to see a few pictures from Winnipeg with numerous copies of the Archdiocese's Centenary Icon of the Holy Family. They were posted by Carl Brownell from Joe-Lynn design Fine Art and Canvas Prints. All proceeds go to the archdiocese to cover the cost of printing. I'm taken by how much they all look like the original. But I did a double-take when I first saw the pictures. 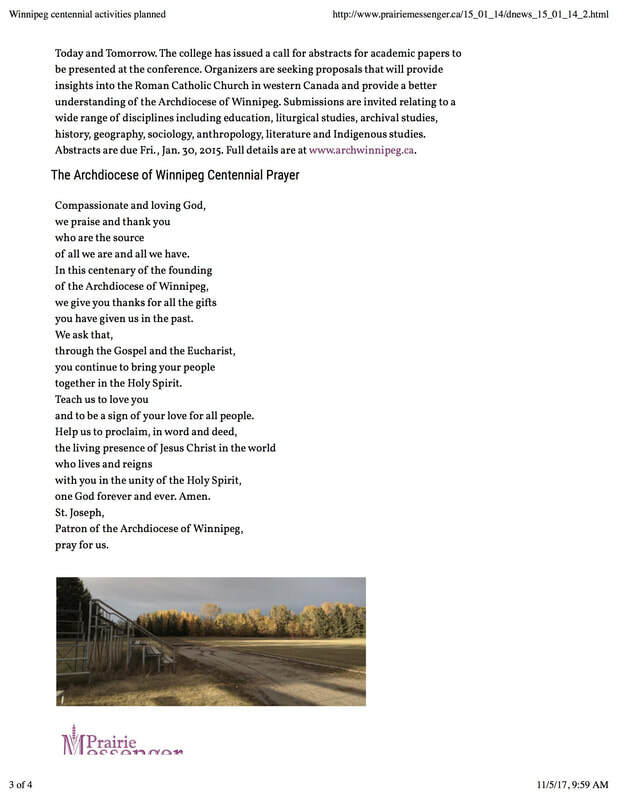 It was a nice surprise to see this Facebook posting by the great Winnipeg photographer Dave Swiecicki today. 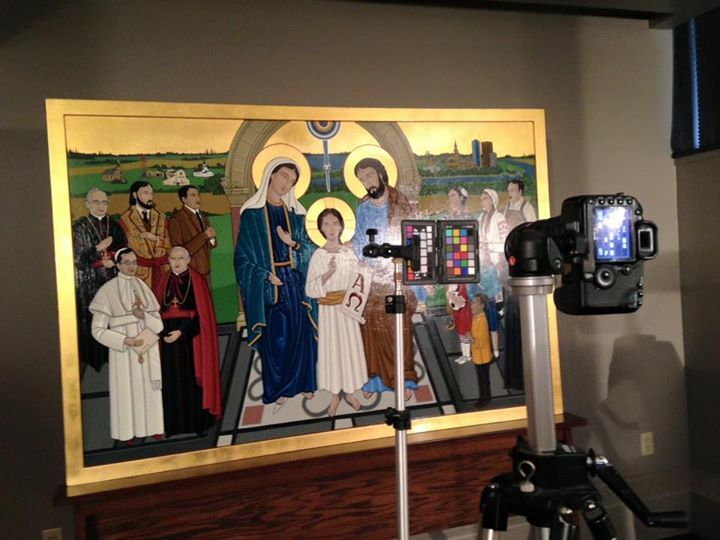 The Archdiocese of Winnipeg had selected him to photograph the Centennial Icon for printing. He is doing the photo shoot today. 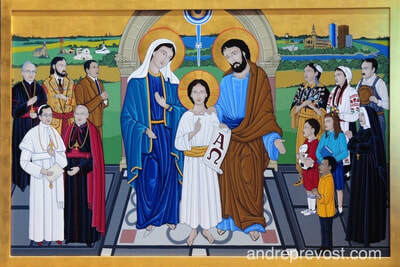 I've updated the Commentary on the Centennial icon of the Holy Family, changing the photograph to the recent one received yesterday. It is posted under the Archival tab, but I've added here also. Click on a gallery photos below to see the captions. 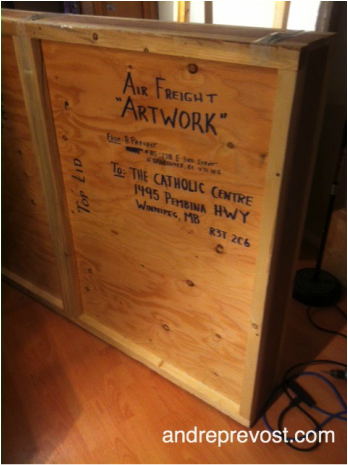 I am pleased to say that the icon arrived safely in Winnipeg at 3pm (Central) and is to everyone's satisfaction. Now this iconographer can rest a bit and start on the next project, a 11x14 icon commission of St. Augustine. Watch the Centennial Mass Live, Sun. 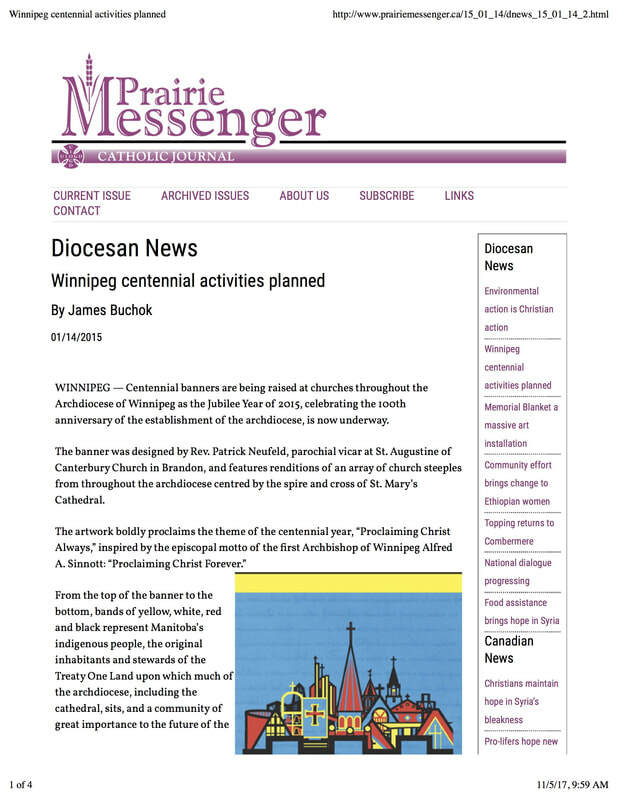 May 3 from the MTS Centre in Winnipeg, on the Archdiocese of Winnipeg website www.archwinnipeg.ca beginning at 12:30 p.m. This will have to be that last 'big' icon that I can do in my small studio. Any future large commission will need to factor in a separate rental studio space that has the room to do the various phases. I am thankful for my son's (and cat's) patience as everything moved and stacked around umpteen times over to tackle each step. So, for each usual step, so much had to be moved. Once the large shipping crate entered our wee world, well, it's all done now. My priority now is to let my body crash and rest, but I won't really breath a sigh of relief until I know the the icon has arrived safe and sound to its new home. I didn't even get a chance to record the icon with my usual detail photos etc. The reality of deadlines. 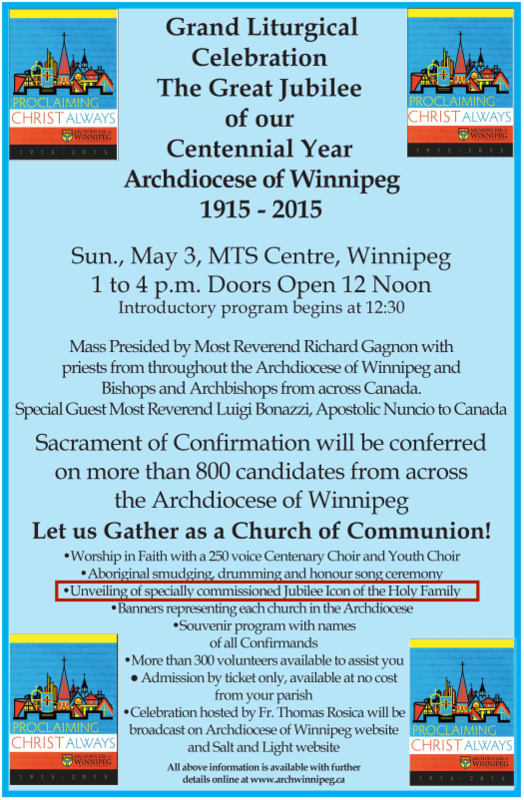 I am pleased that my mother and 2 sisters in Winnipeg will be attending the centenary mass at the MTS Centre on May 3rd. I will be with them in spirit. My next project in the next few weeks is to complete a small 11x14 icon commission for a gift in Victoria, and then I have to get back in earnest to my totem painting series, getting ready for the August exhibition. 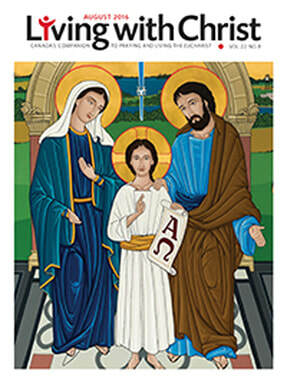 I had received 2 other inquiries for, a) two small icons for July, and b) a 24"x36" Feast day icon for November. I will likely not be able to do the ones for July, but the November inquiry would be doable. So, now to try and catch up on some sleep. Well, there is a first for everything. I got the commission completed at 5:30am today, after 22 hours which started yesterday at 7:30am... after many days of 12-14 hours stretches. Exhausted doesn't quite describe it, but too wired to sleep. Only managed 2 hours of sleep after, as I have much to do today, first getting the second coat of varnish done asap in the hope that it will dry in time to ship tomorrow. I also have to get the crate up from my van to sort out how I'm going to set up the liner etc. By the time I got the materials to create the liner in the crate, I get to start working on it this late in the day. I just have to push through the exhaustion yet again as I have to call Fed Ex early tomorrow morning. Won't be able to get a decent pic of this one as I've had to add the 1st coat of varnish it as I went along, and once the varnish is on, there is no way to take a pic without glare. 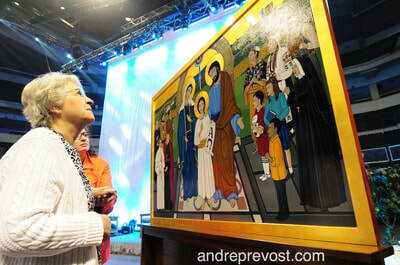 Am glad that my mother and my two sisters who live in Winnipeg are able to attend the Centenary Mass at the MTS Centre on May 3rd, and see the icon. Was suppose to start on all the faces 'yesterday' and am still working on completing the clothing on all the figures! So much work to get done in not enough time. Tired would be an understatement, and so many kinks in my neck and back. It is already 12:57pm and the I'm suppose to varnish the icon by late tomorrow night (ideally needed to be done tonight but I still have 4 days work to get done today and tomorrow). Another full day. 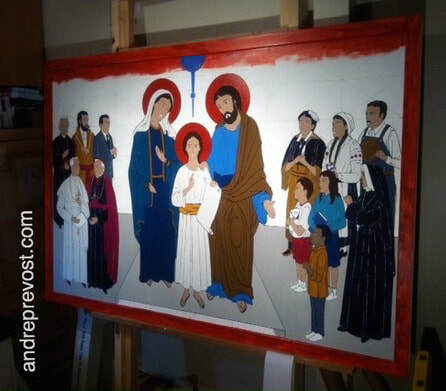 Only 3 days left to go to get this icon completed and varnished...and so much still to do. Rest will come after the icon heads out to Winnipeg next Monday! Well. It' s down to the wire! Including today, I have 4 days to get all the figures completed and 1 day to complete the background! A herculean task. Let's just hope that the stamina holds out until the icon heads out a week today. Well! Enough with Murphy's Law already! 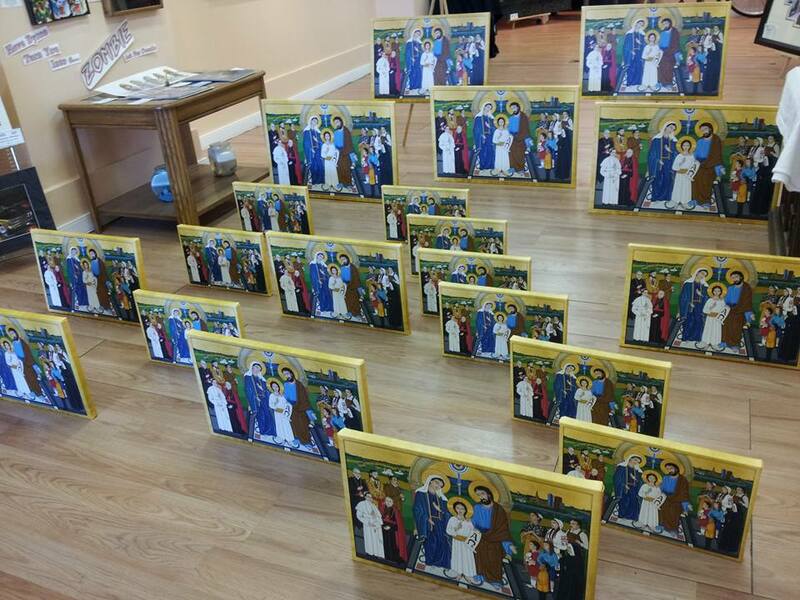 Today was the day that the icon was going back on it easel so that I could get back to paint. So few days left for so much work. BUT...I found the the gold leaf in one corner had reacted somehow to something and it looked bad. And of course, you can't just fix one spot as it will look radically different from the rest. So, I had to make a difficult decision, knowing that it would cost me another day. But this time, because I had already sealed all the gold, I had to protect all sealed surfaces that weren't being redone as gold leaf bits will stick to the sealer and look radically different from the rest. Painter's tape and paper it is. The gold finally looks like it should after the third attempt. I'm wondering whether it is my gold size as it is stored in my studio cupboard that gets pretty warm. It may not be setting to tack as it should because of it. There are many variables that can affect the process. No matter what, I'll have my son help me get the icon back on its easel tonight and I can finish the trim around the new gold and seal it once it is right side up. I just desperately need to paint as there are only 4 - 5 days left and 15 images to still develope (along with 15 faces - 3 historical) and a landscape to complete!!!! Day 8 and it is finally back on the easel! Packing it in on the icon for today. Not feeling well today, and it is 7pm after all. Been working on the flooring and arch of the design the last few days, getting the patterns and colours to work to my satisfaction. Will be back at it tomorrow. Pretty exhausted today after my trip to the Island yesterday to pack up my 'Journeying With The Totems' series. I needed to take today to just veg and try to recoup. I jump back into the Centenary Icon tomorrow, very aware that I only have 23 days before the icon is scheduled for shipping to Winnipeg. A very stressful time given the the design discussions have been lengthier then hoped or planned. The 21 days include the 5 days that I will need for the gold leafing process, in a confined space that I still need to find a solution for. This is such a large and complex icon. I hope to post a picture here very soon, after I've had a few days to move forward with the writing in general, and resolving the background landscape requirements within an icon. 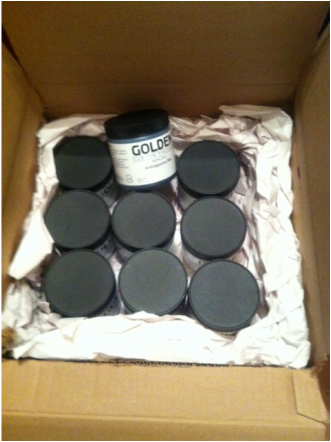 My very expensive installment of archival quality paint has arrived, minus the Cadmium Red that is still to come. It has more then doubled in price over the last few years and no longer available on Canadian Art Suppliers' shelves. How much you ask? For this shipment of 9 - 16 oz jars along with the Red still to come, came out to $1300 after a good discount. And people don't believe you when they ask you about your costs... But this High Load paint can't be compared to the regular acrylic paints. Its signature is a much greater % of pigment in the paint. You can use a fair bit of water without losing the intensity of the colours, and it doesn't fade over time. I work very thinly in my style. The design for the main focus of the icon is in place, with the mix of represenatives of historical figures and cultural groups. Now begins the process of blocking in (and changing) base colours for everyone depicted, keeping a balance between the whole icon. The base colours are not necessarily final but they give me a direction from which I can mix the larger quantities for all the lighter or darker shades as I move along. This process is always interesting for me, in how colours that worked in other icons, don't in another. They will appear as a totally different colour when set next to others: blues or greys looking purple or green, etc. This is also a time when I get a better sense of the positive and negative space as, once the base colours are in place, I can clearly see what available space there is for the background landscape that still needs to be plotted. This too will need to be blocked in as I continue writing this icon. The current plan is to gold leaf anything that you see in red (red bole): the frame, the 3 halos, and whatever becomes the sky over the landscape. The red bole also informs me as to the available space for the icon's background. This is very much in the preliminary stages of an icon. There is much to be done. Actually, this is the most complex icon that I will have written, in the short period of time. Excluding the 5 - 6 days for gold leafing and drying times, I basically have 30 - 31 days. There will be some long days. Nearing the completion of the main design, and I have been able to ink all but a few on the right side. I hope to have the final pieces confirmed tomorrow and then I can begin to write this icon. I am running out of time and this is one of the most complex icons I've done in this size. As you can see, the size of this icon is stretching the limits of my current studio. The design process is moving forward. I think the overall design composition is nearing approval, with a bit of switching some of the placements for some of the personages depicted. Everything is currently on gridded velum paper which is on top of the board. Much easier making changes on paper. I am hoping to transfer the Holy Family image onto the board by Monday, ink it in and then start choosing and block in the block colours for that. I only have 5 weeks to complete this icon. I can transfer the images of the persons on either side as soon as they are confirmed. Progress is underway in both refining the design for the icon, along with working out the scale sized drawings for each section. Bear with me as you wait for progress photos, but in fairness to the archdiocese, approval for any section(s) of the designs are required before i can share with all of you. It should be coming very soon. After all, I have a April 22nd deadline that needs to be met, so time is of the essence...and flying by much too quickly. Got the icon board prepared and gessoed, and with my son's help, got the board back on its special easel, with some maneuvering. This commission is pushing the limits of my small studio. I miss the larger spaces when I had a house in the prairies. Too bad that 'house' and 'West Coast' are not a match. 3) begin developing each of the 8-10 persons (4-5 on each side) which will represent the archdiocese's history and some ethnic groups making up its population. Got the front of the icon board sealed and added 3 coats of gesso yesterday. But before I can continue (and I am headed to the Island tomorrow for a few days for the painting exhibit reception), I needed to flip the board onto its front and seal and paint the back of the board. It can be left this way while I'm away in order to completely dry. That protects the board from any warping over the period that I am writing it. It is not as critical when using 3/4" birch plywood along with the 1/4" front frame, but the stresses of an unfinished side leaves it open to drying or absorbing moisture, and warping because of it. That is why I also build a proper support easel for a piece this size, again to avoid stresses on the board when resting against an uneven surface. Before I flip it back again, although seemly a backward process, I also need to add my monogram, year, and any inscription on the back, even before writing the icon. Why? It's a logistical problem. 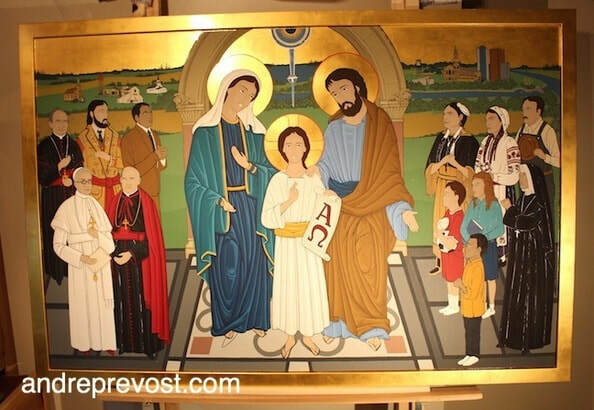 Once the icon is written and the gold leafing is done, for a piece this size, it is far too risky to lay the icon on its front to add the inscriptions at the end. This is what I'm up against in trying to prepare a large icon board in a very small condo studio. With a lot of shifting, I have a 14" work space on one side at a time (at most). I need to plan my strategy for adhering the muslin on the front surface, factoring that it has to be done very fast (and working out air pockets) before the gel medium dries. This is a hateful process under the best of circumstance where I've had ample room all around in my previous studios. Received a call today saying that the icon board has been constructed and ready for pick up. So the process of preparing the panel will begin this week prior to my day trip to Parksville BC on Monday to deliver the totem paintings for the second exhibition. 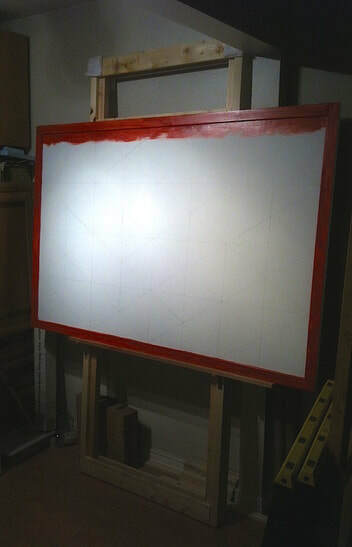 Once I pick up the board with raised front frame, the first step will then be to adhere the muslin/canvas to the board. This is difficult under the best of circumstances as you need to work fast before the gel medium begins to dry, and work out air pockets along the inner edges of the frame. Now, trying to do that in a confined space cranks up the stress factor. Once the medium dries, you need to do a rough sanding before beginning the gesso layers. No less then 8 coats are required, with sanding after each 2 coats; working with finer sand paper as you go. I stay in contact with the Archbishop in furthering the design. 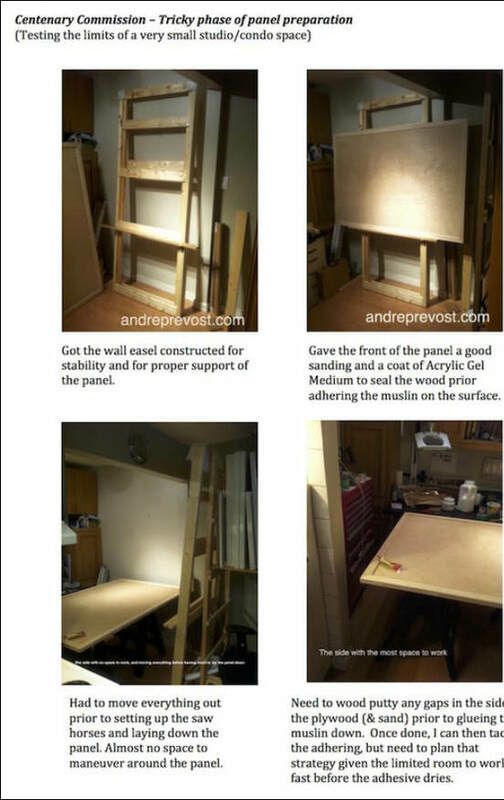 But I have reached a point where I need the full scale panel to continue that process. We have been visualizing the design on small 8" x 11" mock ups. The composition and positions of the figures will be better served by working to actual scale rather then trying to visualize it from a small drawing. 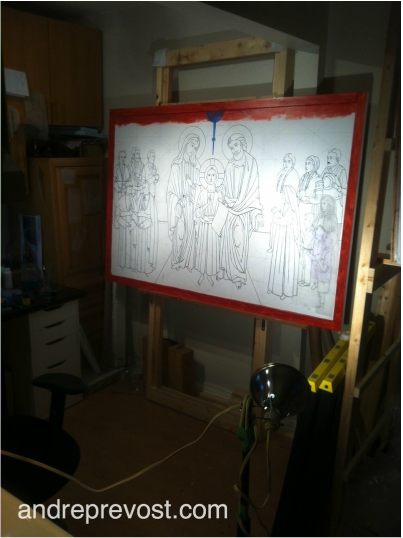 It also becomes easier to have each personage on a separate piece of tracing paper and move them as required on the panel before transferring each permanently on the board. I had originally planned to post an update once there was a confirmation of a centenary icon commission. But given that the back and forth as to what the content of the icon should be is still underway, I thought that I should at least post a note. The design of the icon is complex in that the centenary has a specific theme and the back and forth has been about how the theme can be implemented within the icon itself. The original time frame for completion of the icon was early January, but with my two back to back art exhibitions from late Janyary to the end of March, we were looking at postponing the completion of the icon until April. 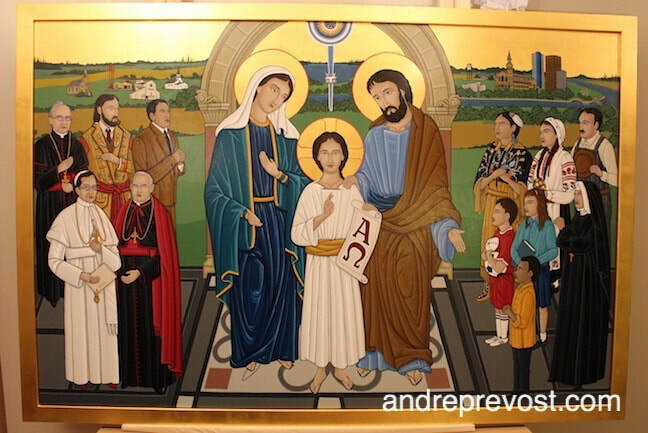 But with the decision process still underway, and no firm agreement in place, it is hard to know when I could start preparing the large icon board or when the completion date will be. I hope to receive word very soon about my most recent recommendation for the design of the icon. There is much to do in preparation; ordering the archival paint supplies, getting the icon board constructed and prepared traditionally, etc.